Description: The unlikely teaming of military leader George B. McClellan with Peace Democrat (Copperhead) George Hunt Pendleton as presidential and vice presidential candidates in the 1864 election is ridiculed here. The artist charges McClellan with disloyalty to his former troops by virtue of a “peace at any price” campaign. 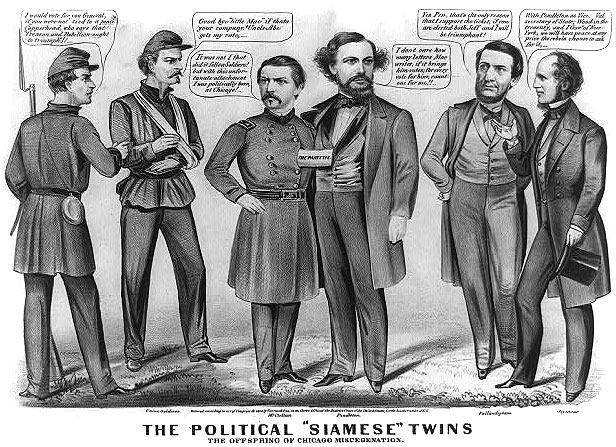 In the center McClellan (left) is attached to the side of his running mate by “The Party Tie.” McClellan says apologetically to the two Union soldiers at his left, “It was not I that did it fellow Soldiers!! but with this unfortunate attachment I was politically born at Chicago!” The Democratic national convention took place in Chicago on August 29, 1864. The cartoon appeared late in the brief 1864 campaign.